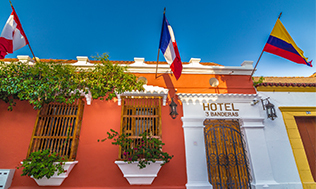 Hotel 3 Banderas is located in the historic center of Cartagena. It has been restored in its originality while maintaining the magical style of the period. Our boutique hotel has two internal courtyards located on the ground floor, and a terrace, pool, and spa on the third floor. Choose comfort, relaxation and elegance in our magical Hotel and enjoy a unique accommodation between the corners of the beautiful Colonial city of Cartagena. Our hotel is located at about 50 meters from the San Diego Plaza and the Sofitel Santa Clara Hotel. Our boutique hotel is in the magical historical center of Cartagena. The styles of the balconies in the hotel are colonial and republican which create a mystique and unique atmosphere. Our 16 years of service in Cartagena shaped us into a hotel that is recognized by its assistance and exemplary attention to the customers. We are also known for being a quiet and peaceful hotel. Thanks to our ideal location in the heart of the walled city of Cartagena, our guests have easy access to a large variety of important landmarks and restaurants. For security reasons, visitors that are have not been registered at the time of check-in will not be allowed within the rooms. Non smoking hotel, non-smoking rooms. 2 smoking areas in the courtyard. Penalty of 200 USD per person for smoking in rooms. Hotel only serves breakfast at the restaurant area. Method of payment: Visa, Mastercard, Debit Card, USD dollars and Colombian Pesos.